A common refrain amongst the buy-side this year has been the switch into undervalued emerging market assets. Some evidence of this can be found in the flows into Exchange Traded Funds (ETFs), which track EM equities. 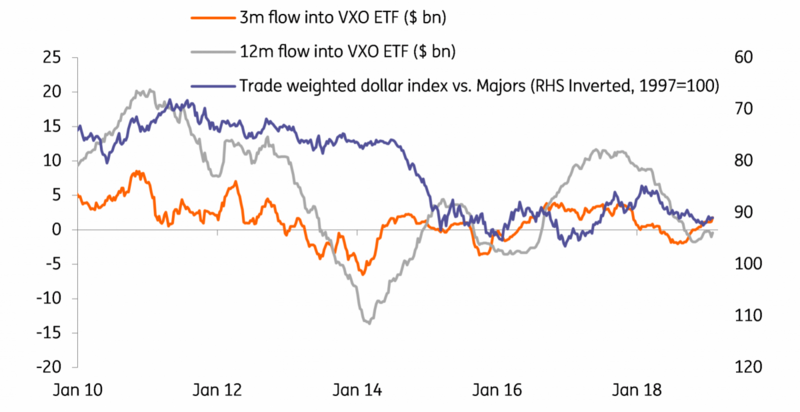 One of the most closely followed ETFs in the EM space is the VXO, a Vanguard fund which tracks the performance of the FTSE Emerging Markets equity index. On a three month basis, this ETF is now seeing the largest amount of inflows since December 2017. As long as the US-China trade truce holds, we would expect this theme of rotation away from the US to keep the dollar gently offered across the board – especially against the high yielding, activity currencies, many of which are found in emerging markets. However, sluggish growth in the eurozone and the Brexit debacle are preventing much of a recovery in European currencies. And it’s hard to see that story changing substantially over coming months. As such we expect EUR/USD to languish in a 1.13-15 range through the early part of the year, before embarking on a move to 1.20 by year-end if the European Central Bank is in a position to hike the deposit rate in 3Q19. Clearer signs of a US slowdown would help this narrative too. Probably the biggest risk to all of the above is Raoul Leering’s potentially much more negative scenario on trade. A full revival of the US-China trade war – as we saw last summer – would pull the rug from the emerging market re-rating story. Equally, a possible Commerce Department ruling by 17 February that auto imports prove a national security threat could smash European currencies. Whether President Trump chose to implement any recommendation would determine the full impact on the euro – but such a move would indeed represent the use of a big stick and likely send EUR/USD under 1.10. The sliding euro would also drag auto supply chain currencies in CE4 with it.